I'm sharing this story of how faithful God has been in my life to honor and glorify Him and to encourage you, dear reader, to allow Him to do the same in your life. He is stretching my faith beyond what I ever could have dreamed. He is asking me to trust Him with the big things and the little things and to rely upon Him always. He has been showing me what a blessing it is to have to rely and depend on Him for each need, rather than taking things for granted. Oh, what a glorious adventure each day is when we live in a way that is dependent upon God for every need, both temporal and spiritual! The following are excerpts from my journal from the spring of 2011. I feel it necessary to share so that whoever reads this blog of mine understands how the Lord was working and moving in my heart and life, long before I understood what He was doing. He has a beautiful plan for each of us and even when we don't see it, He's moving. Through these words, you will see how He prepared my heart for what was to come. All praise is His! I feel like a page in my life is turning and You are beginning to write a new chapter. Oh, I am so excited! Even though I've seen Your faithfulness evidenced in my life, why do I still find it difficult to trust? Come help my unbelief. Teach me surrender. I read an amazing post on Jade's blog! What an encouraging story. It seems like I read it at the point in time I needed it most. It has challenged me afresh to surrender all to the Lord. I see these beautiful ways you bless others, like Corrie ten Boom, and then I wonder why I don't see You in my life like that. And I begin to think you must love them more than me. And I must not be as special as they are to You. But, maybe I simply don't surrender. Maybe I don't even believe that You want to bless me beyond what I can imagine. Maybe I don't even ask and You want me to ask so that You can prove Your faithfulness to me. I want big faith. Put on my heart whatever it is You want me to ask for. I never want finances to hold me back from living in total faith and dependence on You. I am surrendering my needs into Your hands and trusting that You will supernaturally supply. I have felt for so long that You want me to entrust this part of my life to you. I surrender my debts and my finances to You. I trust that You will provide in a more beautiful and supernatural way than I can even imagine right now. I trust You will work out all the details. I have never once gone hungry or needed something that You haven't provided...So I believe. I know I cannot afford to pay off this debt alone and pay for Ellerslie. Only You can get me there. ...I need Your guidance and direction in whether I should quit my job at the Italian restaurant where I work. Should I stick it out, and if so, for how long? I'm subjected to such worldly and ungodly things there and I despise being around it. I just feel like you must have so much more planned for me! If not, why did you plant such dreams in my heart? I cannot know that more exists if I must settle for less. I feel like You're asking me to quit, but how can I be sure? And even if I quit, what am I to do after that? I have no other job awaiting me and no idea what to do. I realize how far off my dreams feel and right now it seems I shall never get there. I know it will only be You that works the miracles. Keep my eyes fixed on You alone. Open up the doors You want me to walk in and close the doors You want closed. May nothing hold me back from Your dreams and purposes for my life. Open my eyes to see Your faithfulness. May I see the ways You work and move! I feel a change is coming...Reveal Yourself to me, God! May Your Kingdom come, Your will be done! I ask that You unfold Your beautiful plan for my life in Your perfect timing. Is it really going to be far better than I could ever imagine? Sometimes I'm afraid I will be left disappointed, but then other times I feel so eager and excited over what is to come and what You are going to do in my life and with my story. I know You can do all things and You are great, yet I am nothing. You whisper to me how in You, the weak are made strong. And I am one of Your weak ones. And I want to be used for Your glory. "God wants to draw you out to what He's called you to!" -P.N. God's doing something big, but I'm not sure what. He's cleansing me and purging me of everything not of Him. I felt Your gentle tug, pulling me away from that place. (the restaurant where I worked). But, then the fear would rise up in me and I would doubt whether or not I truly heard Your voice. One Friday night going into work, right before walking in the door, I got this sick feeling in the pit of my stomach. Like "I am not supposed to be here." Then, over a couple weeks, the Lord showed me that I don't have to put up with such crude behavior and He has far better for me. So, I quit. I still had doubt when I did. But, I followed where I truly thought the Lord was leading and believed He would provide! As soon as I quit, I was flooded with this peace that I had done the right thing. God, I know You've been asking me to trust You in this area of money. I know You can make a way for me to go to Ellerslie. Yet, I have no idea how. I still have this student loan hanging over me. You've been showing me for years it's okay to trust You with everything. And by everything, You mean everything. Even the things the world says You don't want to be bothered with, or you have no control over. Even those things...even money. I have never felt like You want me to ask others for money. Some people think I should ask for support to go to Ellerslie, but I have always felt You desire to supernaturally provide, without me getting involved. I desire everyone to see Your faithfulness in my life, to build their faith. May I not try to manipulate my life and my story, but faithfully allow You, the Author of all things lovely, pure, and true, to script each word, each sentence, each page, each chapter. May I dream the dreams You have for me. I surrender (yet again) my finances to You. I'm so scared to do this, but I know You're asking me to. I know quitting my job was the right thing to do...but, what next? In reality, I need money. You can't live in this world without it. But, I also know You control all the money in the world. Please take care of my needs. And may I never cease to praise You for providing! I have student loans that need paid off. I'm asking You, my Heavenly Father, as a faith-filled daughter, please take care of my needs. You know better than I that I cannot afford to pay back my college loans. So, I ask that You supernaturally provide. I don't know how You will do it, but I trust that You will! I'm asking that either in June or October, You will provide the way for me to go to Ellerslie and all will see how You provide! I know You don't want me to try this alone or to ask others for finances. Wipe out my debts! Help my unbelief. I am so blessed and humbled and brought to my knees. I am so undeserving of what the Lord has done for me! Yet He does it anyways and I am so thankful. Oh, how sweet it is to see how things come together and to see how the Lord has been working and moving in my heart! God has been asking me to entrust this area to Him, the area of finance. The area nobody thinks God wants to be a part of, yet He delights in every detail of our lives and caring for all our needs! I must choose to surrender this afresh each new day. The Lord has given me so many stories and testimonies of others that has been such a faith-builder for me and has challenged me to lay down all at the feet of my precious Jesus. I surrendered my debts and my dreams into the hands of my perfectly capable, faithful Father. I admitted how incapable I am to do anything apart from Christ (which has been a HUGE lesson in this). I am nothing, He is everything! I knew I couldn't afford my loan on my own, so I gave it to Him and asked Him to take care of it/me. So that when he did, I would know beyond anything, it was Him! And so I wouldn't take it for granted, but always be thankful and rejoice over what He has done! Oh, how my heart is overflowing with such joy! God began working on my heart and showing me I was to quit my job at the Italian Restaurant where I was working. For weeks, I wrested over whether this was really God or just me. The way I was treated there was not the way a daughter of The King should be treated, and it was as if God whispered to me, "You are My girl, and my girls aren't to be treated this way." The last Friday night I worked there, right before I walked in the door, I was flooded with a sense of Oh my gosh, I am not supposed to be here. The logical side of me was like, well what am I supposed to do? Is this really God? Am I crazy? I don't even have another job lined up, so what am I to do. God made it very clear to me that He would sort everything out and I was simply to trust Him. I realized that nothing was going to get moving until I obeyed what God was asking me to do...I realized He was testing my faith and wasn't going to give me the satisfaction of seeing what He had next before I took that step of faith and quit my job. A few other things along the way happened and I was sure it was God leading me to do this. After I quit, I was flooded with a sense of peace that I had done what God had asked me to do and I trusted I was in the center of His perfect will. I got into a minor car accident at the end of March (and by minor, I mean it happened in a parking lot and a guy backed up into me as I was slowly driving by...so hardly classified as a car accident. Thankfully nobody got hurt!) and right from the beginning I saw how God was working it into a positive thing, by paying for all my chiropractor expenses. I took my car to get an estimate of how much it would cost to be fixed. (the accident wasn't my fault, so my insurance company wasn't paying for anything.) I almost didn't even take my car to get it looked at because it barely looked like anything had been done and I wasn't at all concerned about cosmetic damage...I just wanted to make sure the car was safe. A couple days later, a lady from the car shop called and said because of how many miles my car has on it (not because it couldn't be fixed) she was declaring it totaled. She said she was going to tell State Farm it was worth $2,800 and I would have to wait to hear back from them to hear the final decision. Immediately, I was like oh my gosh, God, are you using this money to provide another car for me? Ellerslie? My school loans? He made it clear to me that it was to be used to pay off my student loans. I was so thrilled that He was providing this money for me, but continued to pray and press into Him that everything would continue going smoothly and that His Hand would be in everything. I knew my Dad might try to give me some trouble over the money, since the car title is in his name. And I knew that things could change with the insurance company. Once the Lord showed me this money was to be used for my student loans, I began praying that He would somehow, someway, make the check cover my loans completely so I would be debt free. I had a conversation with a friend of mine last summer and her stories of God's faithfulness have been such a blessing to me. She shared how He provided for her school loans and that He wants to take care of ALL our debts, our spiritual debts from sin and our debts in the physical world. I have come to realize how important it is not to be in debt. The Lord showed me as my Heavenly Father, that I could trust Him implicitly and that I could know that He will always be faithful and when He asks me to do something, He will provide what I need to do it. He asked me to quit my job and He asked me to surrender my finances to Him. "He can command us because He's going to be the One who sustains us to do it." -P.N. "I never want finances to hold me back from living in total faith and dependence on You. I am surrendering my needs into Your hands and trusting that You will supernaturally supply. I have felt for so long that You want me to entrust this part of my life to you. I surrender my debts and my finances to You. I trust that You will provide in a more beautiful and supernatural way than I can even imagine right now. I trust You will work out all the details." The Lord made it very clear to me that I was not to ask for money and to believe that He alone would provide the finances I need. But, when I didn't see the money coming in and only saw the dollars that I owed stacking up, it was tempting at times to believe what the world told me, that God doesn't care about matters such as money. My God was always there waiting to build me up, telling me to trust, even when I couldn't see how He was working. "I would much rather be the trusting child of a rich Father than a beggar at the door of worldly men." "God takes His prohibition of asking for money very seriously, just as He means it seriously when He says He will care for and protect us. However, if we seek to raise our own money, then God will let us do it-by ourselves. Many times we will be able to raise great amounts of money by human persuasion or downright perseverance in asking. But we will miss the greater blessing of letting Him supply all our needs according to his own riches. God has more for us than we would think of asking." Anyways, back to the story... :) I was secretly smiling to myself on the inside lol and believing that God was going to take care of my entire loan. The next day, State Farm Insurance called my dad and said they were declaring my car totaled, but we could keep it and they would give us a check for....$3,440...almost to the dollar amount what I owed on my student loan!!! Overnight, it went up over $600! If you saw my car, you wouldn't think it was worth $2,000! My dad was shocked, I was shaking and I felt so humbled and so blessed. My car is back on the road now and I believe it will keep going and going. I will never again look at my little tin can, that's what we call it, :) the same. It has no AC, a dented hood from hitting a deer, and two different spots from two separate accidents. To the world, it looks like a piece of junk. But, to me, it will always be a reminder of the faithfulness of my God. I joyfully ride around in 100 degree weather with no AC because I see how God used that little car to take care of all my needs. I see how He used something like a car accident that most people couldn't see any good in and He turned it into beauty. I almost drove my mom's car to work that day, but at the last second, I grabbed my own keys. I now see that was God. I now see He planned it to the exact second that I would get in the accident and He would provide in this way. And nobody was hurt badly and my car is still driveable. 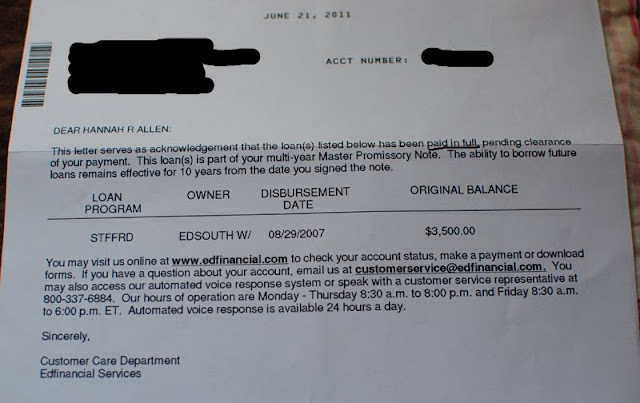 I had these debts hanging over my head for 3 years...now I am freed of them. Earlier in the week before I found out about the car, the Lord showed me He wants me to share with others when I pray boldly and specifically, so it will be a much more powerful testimony when He comes through. I didn't tell my dad and he was still really blown away by the story and thankfully let me use the money towards my loan, however I realize now how important it is to share with others when you are praying God prayers, asking big things most people wouldn't dare to ask, and trusting He will make a way, wow what a testimony that is! Does this mean I will never struggle and doubt again? But, I am changed. I see in my own life (not just from the stories and testimonies of others) how God deeply desires us to surrender all to Him. There are a couple things in my life right now that I don't know how I'm going to pay for them, but the Lord is my Shepherd and my Treasurer. He is very wealthy. He tries my faith, but when I am obedient, then the money always comes just in time. After paying off my student loan, the Lord began to lay it on my heart to apply to Ellerslie for the fall 2011 semester. My faith had been so strengthened after God supernaturally provided the $3,400 and I knew another few thousand is nothing for Him! I mean, come on, He owns the cattle on a thousand hills! (Psalm 50:10) I had exactly $50 left over after paying off the loan, which is how much the application fee to Ellerslie is. Not only did God provide for my loan, but He provided for the fee and as soon as I realized how much was left over, I knew He was asking me to step out in faith and take that step of applying. The days and weeks after paying off my loan, I felt like a different person. It literally felt like a weight had been lifted off of me and I was lighter. Such joy and gratitude filled my heart! I would just smile and laugh and say over and over "I am debt free!" It was amazing to see the Lord work in my life in such a big way. He took away my doubts and assured me that I truly did hear when He speaks to me. Clearly I could see the Lord's hand in each step. I knew that I wouldn't be able to apply to Ellerslie until I payed off my loan. And at the rate I was going, it would take years. So, God took me through this amazing season with Him, a season of surrendering all to Him, so when He came through and provided, I would know it was Him. It all happened so much faster than I thought it would. And the fact that it happened so fast, I realized God must want me to go to Ellerslie soon. Or else why did He make a way? Paying off the debt was the first step and He took care of that. Now, He was asking me to apply. Even though He had just provided in this huge way, I still had lingering doubt, wondering if He would do it again. I wrestled for weeks over whether or not I should apply. At first I thought I would and if I came up with the money I would go, but if not, I just wouldn't go. That was until I was doing some research and saw that from the date of acceptance, you have 30 days to pay the first $500 nonrefundable deposit and another 30 days to pay the next $500 nonrefundable deposit. This put some serious doubt and concern in my mind and I knew that if I was applying, it would be for real and I would be trusting God to supernaturally provide everything. I knew it would be a miracle for me to come up with the first $1,000 in that amount of time. Here I was, jobless, and yet applying to a place that would cost me several thousand dollars. I had other expenses that were stressing me out (mainly dental work) and I wondered how I'd pay for this, let alone Ellerslie. These new expenses felt like a giant road block. I kept asking the Lord and pleading with Him to give me peace over whether or not I should apply. I slowly let doubt sneak into my life and it consumed me for a while. I was feeling really discouraged and didn't feel direction in my life. The thought and dream of Ellerslie wouldn't leave my mind. And the thought that October 2011 is when I'm meant to go remained. Is this another test of my faith to see if I will obey and trust You wholeheartedly that You will provide every dollar I need for everything. I'm desperate for Your guidance and direction in this. Kala texted me last night when I asked her if she had any advice or wisdom about whether or not now is the time to apply to Ellerslie: "Trust Him to give you the answer and have faith He will provide you with one. You might not hear a clear answer which requires you to rely on faith in silence, which is faith of the strongest sort. If He doesn't want you to go, have faith He will stop you. Otherwise keep walking forward without stopping or questioning if you are going the right way. Also, if the road leads to Him, I don't know how it can be wrong. What is your gift? Faith. It is confirmed." Kala said several months ago how my gift is faith and then another friend just said it as well a couple days ago. I can truly believe that. The Lord is constantly building, strengthening, and stretching my faith. What a beautiful adventure this life with Him is! :) How thankful I am that God gave me such an encouraging and challenging friend in Kala. I specifically remember conversations with her in my times of extreme struggle and doubt, when the Lord used her words to uplift me and to speak truth into my life. I feel stressed out about how I'm going to pay for everything I need to pay for. O God, You are my God. Several things happened in the month of June that discouraged me and took my mind and heart off where God was leading me. A young man I had gone to school with for years passed away in a tragic motorcycle accident on June 16. I was devastated and reminded of how fragile life is. The Lord was faithful to deal with my heart and comfort me during this time. I was dreading telling my dad about this dream and that the Lord was calling me to Ellerslie. I knew I had to and that it was important to receive his blessing. I prayed that the Lord would prepare his heart for the news and give me the strength to tell him and that it would be in His perfect timing. On Father's Day, I ended up talking with my dad for a couple hours and shared with him my dreams and desires that I know God has given to me. I know God gave me the grace to do this because I never talk freely with him about these things. He didn't fully understand, but gave me his blessing. Thankful to have that. Mom has been supportive of this dream the whole time. Can't depend on my parents for financial support and don't want to. I trust my Heavenly Father to provide...He is all I need. Just another opportunity for the Lord to prove Himself faithful and show His supernatural provision in my life! On July 1, during my time of seeking the Lord over whether or not I should apply to Ellerslie, he showed me that it was indeed His will for my life. He showed me that the motives of my heart in going were pure. I desire less of me, more of Him. This is about Him, not me. On July 2 (my mom's birthday), I stepped out in faith and applied to Ellerslie. Still felt somewhat nervous about it, but peace flooded in. Daily, I surrendered this dream to the Lord. Daily, He assured me I was in the center of His perfect will and that I could trust Him. I asked that He would stop me from applying if I wasn't meant to. After I stepped out and applied, I then asked if I wasn't meant to go, that I wouldn't be accepted. Debt cleared. Apply to Ellerslie. Wait, wait, wait. Get accepted? God, please sustain me in this season of waiting! How easy it is to stress about the future. Oh Lord, may I stay so close to You that I am certain I'm in Your hands and You know what You're doing. Still no word from Ellerslie. But, I truly believe I'm going in October. You've layed that date on my heart. On July 11, I received an email about setting up a phone interview with Sandi, the Dean of Women at Ellerslie. The interview was set for the afternoon of July 14, 2011. I felt nervous about the interview, not knowing what to expect, yet certain I was in the Lord's hands. When Sandi called, right away I felt peace and calm. She told me she already knew about my story through Bex, one of my dear friends, whose son was adopted by the Ludys. She said I had a truly sweet story and didn't really know where to go from there. Basically at that point, I had a feeling I was accepted. What do your parents think about you going to Ellerslie? Describe your prayer life and how/how often you read the Bible. What sort of books do you like reading? She then asked some more personal questions and we had a sweet time of fellowship via telephone. :) Then, she told me I was accepted, so I didn't need to be concerned about that! I told her my financial situation and that I don't have a clue how the Lord is going to supply the money needed for Ellerslie, but I trusted He would. She said if the Lord calls someone to go there, He will be faithful to supply! She shared a few encouraging testimonies of past Ellerslie students and how the Lord supernaturally provided for them to go. This greatly encouraged me! Sandi then said to do everything I can to show the Lord I'm serious about this and serious about trusting Him. Sell things, work hard, and save up. And trust Him to provide! She informed me that by the time I come, I need to have payed the first $1,000. And even if I don't have all the money, if God provides the first $1,000, He'll be faithful to provide the rest. It would be a true miracle to come up with that much in the first place! She said that she thought the Lord had already showed this to me, but He is going to use me and my story in a mighty way! Many girls will be able to relate to me and it's really powerful, so the Lord will use my testimony. She said going to Ellerslie will fortify me and strengthen me and build me up and prepare me for this life of ministry and leadership. She said at Ellerslie, the students are taught how to pray, not just mustering things up out of our own heart and mind, but praying God prayers and having His heart and carryingHisburdens. This is exactly why I desire to go to Ellerslie! To be built up in Him and know Him more, love Him more, learn how to pray, learn how to love, how to serve, and be strengthened and prepared for ministry! We had a time of prayer over the phone. I was so incredibly blessed by our conversation and felt renewed and refreshed in the Lord. The Lord has taught me daily, continual, wholehearted surrender in all of this. It's a choice that must be made not just one time. It's giving up my doubts, worries, and anxieties and saying Yes! I trust! I believe! Help my unbelief. It's realizing I have no strength apart from Him. I cannot trust Him, apart from Him giving me grace to do so! On July 15, 2011, I received my letter of acceptance to Ellerslie Leadership Training!! Woohoo! :) Praying at this time that He will show me what I need to do during this season of preparation. I purchased the book, "Rees Howells, Intercessor," by Norman Grubb last summer. It stayed on my shelf for several months until one day in July when I felt inclined to pick it up and read it. It's amazing that the Lord will even orchestrate getting books into your hands that will encourage, uplift, and inspire, and He will show you when He wants you to read it, at the exact right time. The Lord has used this book mightily in my life! I am awakened at a whole new level to the life the Lord is calling me to. Through the pages of this book, He has given me the victory of faith! I truly believe that I am going to Ellerslie this October and the Lord is going to supernaturally provide. He has replaced my doubt and confusion with certainty, trust, and joy! I mentioned before that the first $500 nonrefundable deposit to secure my spot in the Ellerslie program was due thirty days after the date of acceptance. After looking on the calendar to make sure I knew when exactly the payment was due, I discovered the date was August 12, my 22nd birthday! :) I knew this wasn't mere coincidence and that the Lord had planned it all out so it would fall on this date and be extra sweet when I called to make that first payment. Not having a job, I had no idea how I was going to come up with that amount of money in thirty days, let alone the remaining tuition. I knew that it would be by God's grace alone. I was praying He would provide and that He'd guide me in what to do. On July 18, no money had yet come in, yet I was in a place of total trust and dependence and was waiting upon the Lord. Kala and I were talking about how I could step out in faith and tangibly show that I trust God will provide what I need to go. The Lord challenged me to live and act as if I had all the money needed in my hands already. If I had the money right now for Ellerslie, I'd be making all preparations to be ready to go come October. I'd be booking my flight, getting books and supplies, making a list of what to bring, packing, and turning down opportunities and invitations during the time I'll be at Ellerslie. What better step of faith to take than to buy my plane ticket!! Just as Corrie ten Boom's father asked her when he gives her the ticket to get on the train. 'Right before we get on,' she replied. So our Heavenly Father gives us what we need, right when we need it, not a day before, not an hour before. Whether it's strength, grace, and peace we need...or money. I have never gone hungry or needed something He hasn't provided. I don't need the money this day, or He would had provided it. This word came to Rees Howells when he needed funds: "Trust ye in the Lord forever, for in the Lord Jehovah are everlasting resources!" So, I began looking up plane tickets, expecting to find them for around $300. I prayed that I would find one really cheap and found one for much less than that! I wanted to purchase my ticket as soon as possible, even before having any money towards tuition or living expenses while in Colorado. I felt this was an ultimate sign of dependence and trust in God's provision. That afternoon, when I told Kala that I had found some cheap tickets, she said she had planned on giving me a sum of money for my birthday, but wanted to give it to me now. She wanted it to specifically go towards my plane ticket. I felt totally humbled and didn't want to take that money from her. Then she replied, "God provides for us in different ways." To think that God would use my friend to provide for me and that she'd be open to be used! Totally incredible! A couple months ago, I asked that the Lord would take away my desire to go to Ellerslie if it wasn't His will. No, He didn't take it away. He increased it. He gave me the faith to apply and now I've been accepted. He gave me the specific date-October and then payed off all my debts to get me there. Now, here I am in a season of preparation. I have much to be thankful for!! Last night, on a walk, I was gazing at the beautiful sunset, listening to worship music and God spoke this to my heart: "There is a season for everything (Ecclesiastes 3:1). Right now, you are in the exact season I've called you to. The exact place I want you. I am giving you a hunger and a heart for me and a complete distaste for all that this world has to offer. I am saying, 'Rise up my love, my fair one, and come away with me.' I am preparing your heart for Ellerslie so you will be prepared come October. Ellerslie will be a special, precious time of your life that you will forever treasure. But, don't wait until you get there to grow and live. I have lessons for you now. Don't wait. This is only the beginning." In times of doubt, I became very tempted to take an easy way of deliverance, by asking different people to help support me in going to Ellerslie. But, oh the joy I would miss by not going on this glorious adventure of trust and absolute faith! I felt quite strengthened and encouraged by how the Lord had already provided for my student loans. He has confirmed yet again to trust in Him alone. He has shown me many obstacles that stand in my way of going. This has caused much doubt. But, He has replaced that doubt with trust and shown me that it is only by Him alone that I will be going. Not by anything man can do. And man can do nothing to stop Him and His will! He is bigger than any circumstance! He delights in impossibilities! Choosing to praise Him here and now. I still haven't the slightest idea where all the money for Ellerslie is going to come from. But, I know I can trust Him! I know He's already set it into motion. God has revealed something new to me. Feeling discouraged today...what ups and downs are in this life of faith. As an answer to my prayer that the first $500 deposit would be provided for by my birthday, the Lord began opening up many doors! So here I am, waiting again. This whole process is so long and all of it so unsure that God is using it to strengthen my faith. Praise Him for that! Asking the Lord's hand to be over the entire situation. May He direct each step. By this point, I had quit my waitressing job three-four months before. It wasn't that I was against getting another job and even applied a couple places, but the Lord didn't have that as part of His plan for me to get another job where I could depend on the money. He wanted me to depend entirely on Him! He gave me opportunities for work as He saw fit and in ways that were honoring and glorifying to Him. He blessed me with jobs that I truly enjoy and I didn't have to be around the worldliness and ungodliness that I was at the restaurant where I had worked. I prayed that the Lord would open up doors for me to babysit and I began getting several jobs, quite a few nights a week! On one specific night, I got three requests! When you pray for something, believe that He will answer! What a joy to spend time with precious little ones! I see my Jesus in their innocence and sweetness. When the families I've babysat for asked me how much I charge, the Lord led me to tell them I trusted they'd be fair. I prayed that He would give me how much He wanted to give me through them and I didn't want to put limits on that. This allowed Him to bless me above and beyond what I could have asked for! I had the opportunity to photograph a couple weddings in July (another passion and joy in my life) and made a bit of money with that. Also had several other photography sessions. Over the last couple months, the Lord has shown me that so many things I have, I do not need. He has led me to sell things on craigslist and ebay. I have already sold more than $200 worth of stuff and am still listing things. It's amazing that through this whole process of preparing for Ellerslie, He is teaching me so much in each step. It's not all about Ellerslie, but how much He can teach me in the waiting and the preparing. He's shown me that material things do not matter at all and I cling to them too much. The Lord has also shown me that He is a God of order, not chaos. I spent several days organizing and cleaning my room and belongings and deciding what to sell, give away, and throw away. The week that the first $500 was due, I had around $250 and started wondering if I'd get all the money in time, but just really felt like I needed to trust and believe I'd have it. 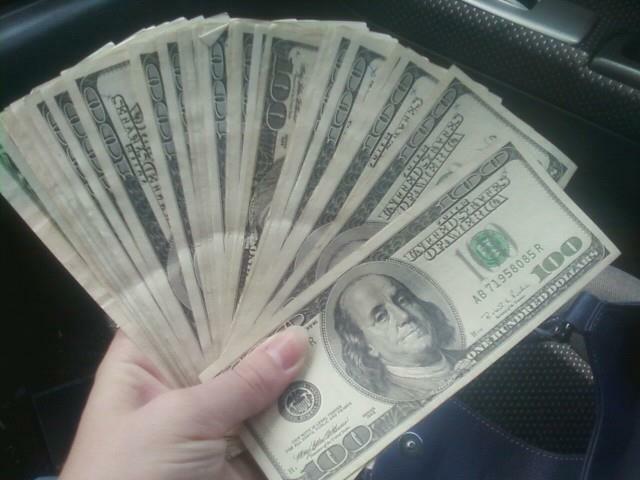 That week, a good friend of mine asked me to babysit and blessed me with much more money than I would have asked for! How precious it is to see God provide through others when they don't even realize how they are being used! I called Ellerslie that day and made the first $500 nonrefundable deposit, on my 22nd birthday. What sweetness. As if this wasn't enough, the very next day, my brother handed me a $100 bill and said it was for my "Ellerslie fund." I used this money to purchase necessary books for class, paid my shuttle fee to get from the Denver airport to campus, among other necessary things. Thus far, I have paid $500 towards my Ellerslie tuition. I still have no idea how God is going to provide the rest of the money needed. I am doing what I can, but I know that will not be enough. Please pray for His supernatural provision in my life and that He gives me the victory of faith! And that it will be a testimony to everyone when they see God's faithfulness. I got my wisdom teeth pulled today and that is an unexpected expense that has given me some anxiety. I meditate on His unchangeable love, power, and wisdom while I pray about my present spiritual and temporal circumstances. Jesus in His love and power has supplied me with what I have needed, exactly when it is needed. In the same unchangeable love and power, He will provide me with what I need for the future. He wouldn't call me somewhere or to do something without providing the means to do so. Ellerslie doesn't seem like a distant dream anymore...something that is rather far off and I can plan for it later. I am doing a little bit a day to prepare so that I'm not overwhelmed and stressed out when it comes time to leave. Some unexpected car payments came up and I literally had no money. I was crying out to God, telling Him the situation that of course He already knew. But, He wanted me to surrender it. My heart caught in my throat and I began shaking. Someone had put this little envelope into the mailbox, totally unbeknownst to me. I slipped the package over the envelope, as to not let anyone see it until I saw what it was, and rushed inside. I found a place to myself and with trembling hands opened the envelope. 20, 40, 60, 80, 100, 120, 140, 160, 180, 200...$200 I counted quietly. Thoughts began swirling in my head about who this could be that did this. But, the fact is, it doesn't matter who did this. The fact is, my God used them to bless me, in the very moment I needed it. in return. Even though I don't see it was you, He sees, and it will not go unnoticed. May all the glory be His alone and may our eyes stay gazing upon His beautiful face! The Lord is romancing me so on this beautiful journey with Him. Step by step, He remains faithful. And step by step, I love Him more. May I never cease to be amazed and humbled by all He has done for me and continues to do! I am so unworthy of all this, yet He gives so abundantly nonetheless! This morning, I am still blown away how He provided that money yesterday. woooow! I know the Lord wants to stretch my faith through this journey. None of it has been easy, but I would never choose the easier road and miss the greater blessing of having to depend on Him for everything and then having the joy of seeing His faithfulness and provision and knowing it's only Him. I look back now and see how quickly I sold several items, worth over $250 on craigslist and ebay in a matter of a week or so. That was only the Lord's provision because I have listed several items since then and haven't sold a thing...trusting He knows what He's doing! I'm finding such joy in sharing my journey, my testimonies with you, even though I really have no idea who all even reads these words of mine, though that doesn't matter. Whoever the Lord wants to read my blog and be encouraged and uplifted by it, He will send them here. Even if one person is blessed, it will be worth all the sharing. I so desperately want you to see how He desires us to surrender all to Him. My calling right now is to share His faithfulness, His mercy, His love that He has poured out on me. And this is no small calling. I have a great responsibility to testify to His might and provision and strength, yet find the greatest delight in doing so! On Tuesday evening(September 27), I took a walk along the shore and had such a sweet time with the Lord. He painted the most splendid sunset just for me! And as I sung out and worshiped Him, He took me to a new place of trust and surrender about my Ellerslie tuition...He refreshed my soul and reminded me, yet again, that I can trust Him implicitly, with my entire heart, my entire being. At this point, I was leaving in eleven days for Ellerslie and still had no idea how God was going to provide the rest of the deposit on my tuition. I hope this finds you resting in the grace of our precious Savior, Jesus. I am emailing to let you know that someone kindly donated $200 towards your tuition..."
From the bottom of my heart, thank you to whoever did this. He inclined your heart to give at the moment that it would bless me most and strengthen my faith in His provision! This grand adventure with Him is so much more beautiful than I could ever have imagined...and so often, I think I've figured out how or when He's going to do something...and then I wake up and am romanced by the mystery I've found in Him. How He takes great joy in delighting me and surprising me. Ahh, what a wonderful God we serve! Eight days until I'm Colorado bound...this journey with so many surprises and twists in turns has got me asking Him with a smile on my face, "what next, my Lord?...what do You have planned next?" I believe the next eight days are going to be wonderful! The next several days were filled with packing and preparations. God flooded me with supernatural peace and trust in Him, that it was out of my control and in His hands. "I just want to let you know that you received a $1,000 gift from an anonymous donor put toward your tuition! :)"
My God had done it. I knew He would. But here He was giving my eyes the evidence of His faithfulness yet again. As I took off into the sky that October early morning, my heart was overflowing with gratitude and joy. I had been so concerned about how I'd raise $1,000 in three months before Ellerslie and then the last day that I can pay it comes and God supernaturally provides it all the moment I need it! It was as if He was saying to me...trust Me. I have everything under control. "I just wanted to let you know that someone has graciously donated $500 towards your being here at Ellerslie. Isn't it amazing how He takes care of us?" Yes, it truly is amazing. And I truly am unworthy. Yet He offers all of Himself to me, in exchange for all I am. He has chosen me. And I choose to follow Him, to love Him. Yet in light of all He is and all He's done, how could I choose any other way? After a few days, the Lord used one of my Ellerslie sisters to give me a sum of money that held me over for several weeks! Most of the meals are provided for at Ellerslie, except for Saturday and Sunday nights. I didn't know how I'd pay for those meals, but every time a mealtime came around, I was invited to a birthday party, invited over for pizza, among other things. God provided my meals for me as well! A few lovely ladies even treated me out to coffee! With a couple weeks left on campus, a few needs were arising. One evening, I got an envelope in my mailbox that had my name and "Because He loves you!" on it, with twenty dollars inside! The next day, I got a little box with my name and "He cares!" on it with nearly twenty dollars in change. Sometimes the little things are the most special. And to know that God would incline someone's heart to give to me and that they'd be willing to! Thank you! I got home from Ellerslie on Tuesday, December 13, having no idea how I was to pay off the final $1,500 due on my tuition. God took me through a process of surrendering it afresh to Him each day while I was at Ellerslie. I knew that when and how He wanted it payed off would be the way it was supposed to be, even if it took me a few months working. So, first thing on my mind was getting a job to start making some money. I was honestly a little confused as to why the Lord hadn't already provided, but knew His ways and timing are far above my own. I had seen my own faith grow in ways I never dreamed. I opened my hands, letting go of the way I wanted things to go. "I am happy to inform you that once again someone has donated money toward your tuition and it is paid in full. Isn't that wonderful? It is so beautiful to witness God's faithful leading and provision." I am debt free! I sit here today, totally humbled and amazed at my God. I am so thankful for this journey He has me on. I will be posting much more about what God has done in me during my time at Ellerslie, but simply the journey to get there has strengthened and stretched my faith so much. I trust my God. My family and friends who hear how God has provided are being challenged. It is especially amazing for my dad to see the Lord's supernatural provision, when he doesn't believe God is involved in areas such as money. But there is no explaining away what God has done in my life. What peace there is in knowing you are in the center of His perfect will. Trusting that He can give you ears to hear His voice, His beckoning, His call. He can sustain you, strengthen you to obey, and give you all you need to follow His leading. So many times I felt like I was silly, nuts, or just expecting too much out of a God who doesn't care about things like money. The enemy certainly tried to dampen my spirits and hinder me from following my Jesus. But, there was always something Greater...He was calling me away, drawing me closer, asking me to trust Him with everything. So many people thought I was crazy to trust God with this area of my life, but I'm so thankful the Lord didn't leave me there and that He kept pressing me further into Him! And I pray that the Lord will use this testimony to give others eyes of faith! I was reminiscing over the past several months and could hardly believe we are about to embark upon 2012. My God is so much more beautiful than I ever could have imagined and His plans for my life are far better than my own. I realize I am just getting a glimpse of His beauty and His plan for me and this is only the beginning. In the spring of this year, I never could have dreamed that before the end of the year, I'd be debt free and an Ellerslie graduate! He led me to quit my job and without a job or anyone else knowing my needs, the Lord provided over $8,000! God alone knew of my needs and He alone supplied them, supernaturally.Beautifully. And I am so thankful to Him and to whomever He used that was willing to be used. Willing to let Him receive all the glory and no man. God has shown me different aspects to Who He is to me...He truly is my All in All. He has shown me this year that He is faithful, He is my Heavenly Father and cares about my every need, big and small. I can trust Him. When you step out in faith and obedience unto Him, you can know beyond a shadow of a doubt that He will guide your steps and supply all you need, the moment you need it! This is just the beginning of the story He's writing for me...this chapter is ending but it marks the beginning of what He holds for me next. All the glory goes to God and God alone! I may not know the way I go, but oh I know my Guide!